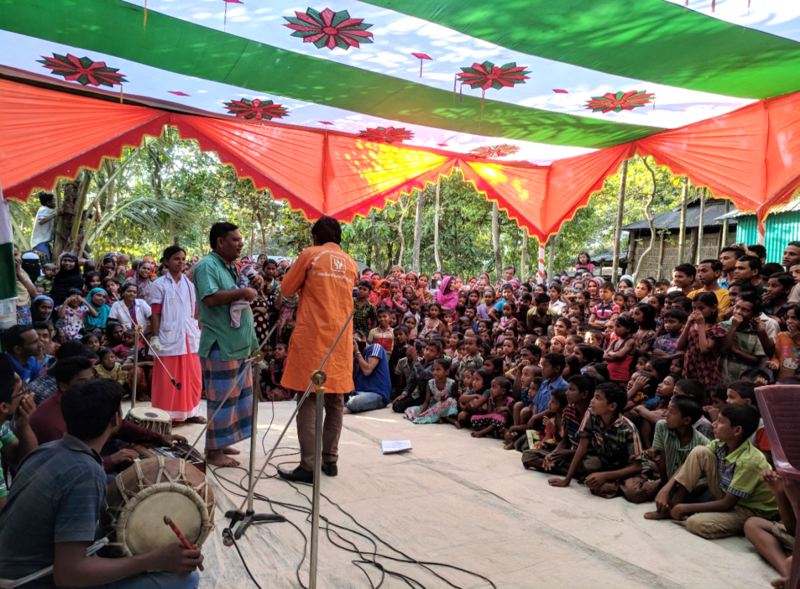 Kate Barwise reflects on her recent program visit to Bangladesh, where she was inspired by women at the frontline of community health. Masuda, Shankori and Shilpi are women who are changing their world. They are entrepreneurial midwives that I met in Sunamganj, Bangladesh. They are improving health access in one of the most remote districts but where maternal and under-5 mortality rates have fallen dramatically in only a few years. These powerful women are also generating more income for their families and changing social norms. After I spoke with them I left thinking; what can we learn from their successes and how can we help more women like them to help more communities? Shankkori being introduced in a folk song to a large crowd in Sreepur village, Bangladesh. Courtesy CARE. Since 2010 GSK’s Frontline Health Worker Initiative, in partnership with CARE, Save the Children and Amref, has trained 67,000 frontline health workers across Asia and Africa. This flagship programme in Bangladesh has been shortlisted for the Global Good Award for Best International Sustainability Community. Building a model that is community-led, where entrepreneurial midwives are supported by the community health workers and community support system and can build trust in the communities they serve, has been vital to ensuring sustainability.